For the past three days I have been Night Processing. That may sound confusing, so I’ll explain. Instead of going out to sea to collect data, I have been processing the data that comes in from the launches. I can’t begin my job for the day until the evening. Survey technicians rotate between collecting and processing data. This science log will summarize the steps that go into turning raw hydrographic data into a navigational chart. Beginning right after dinner, three, four or five, (depending on how many launches were out that day) survey technicians get right to work processing data. CTD casts are used to calculate sound velocity throughout the water column. Night processors take that sound velocity data and apply it as a correction to the raw bathymetry data collected by the launch. Next, the raw data is corrected for the heave of the boat (wave action), and finally for the influence of tides. Then all of this corrected data is merged, and a preliminary base surface (seafloor surface) is created for the bathymetry data. 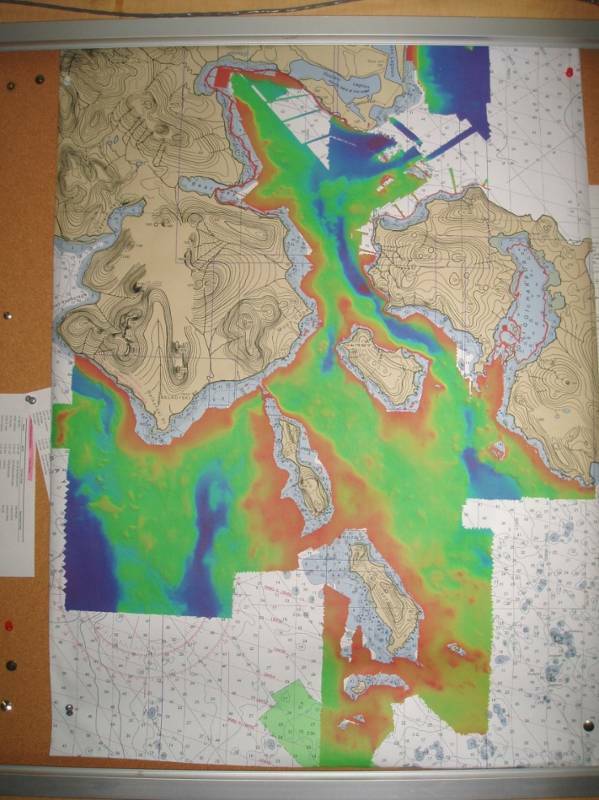 A preliminary bathymetry chart posted in the Mess. To check the preliminary base surface, it is viewed with the corrected raw data overlaid. The night processor scans each line of the merged data and looks for anomalies, variations from the norm that might have skewed the base surface. This scan is a time-consuming process. To an outsider it looks a little bit like playing a computer game. Each survey line is divided into small increments and scanned in cross section. Any obviously anomalous data points are highlighted and eliminated. Once the day’s charted area has been scanned and cleaned, the new data is merged with other days’ work. Gradually, building day by day, an entire work area is charted. To make this process manageable over a sizable area, the survey is divided into sections. Each survey technician is responsible for a section, or sheet. When all of the data has been collected and reviewed, the survey technician writes a scientific report that discusses any data quality issues, and the work that was done. Other information collected, such as bottom sample data, is included in the scientific report. The sheet is compared with the existing, current chart and also with the bordering sheets. The completed field sheet is sent to the Pacific Hydrographic Branch (PHB) in Seattle where it is reviewed and checked for quality. Finally, the sheet is sent to the Marine Charting Division (MCD) in Silver Spring, MD. 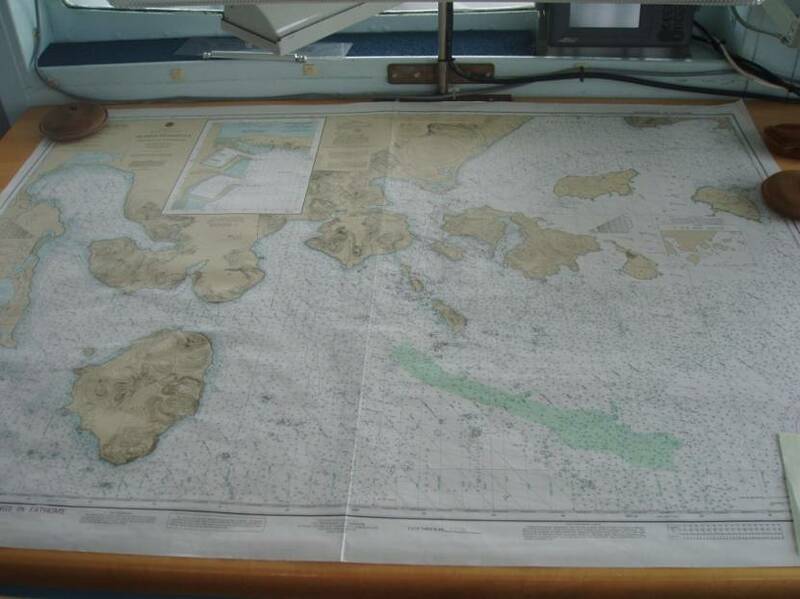 The Marine Charting Division chooses the actual soundings that will appear on the chart and publishes it. An important exception to this step by step process occurs when a danger to navigation is discovered. Dangers are fast tracked, and the information is released to the public almost immediately. The current chart on the Bridge. The red circle indicates the area in the bathymetric map above. Vocabulary: Hydrothermal vents -places on the seafloor where warm or hot water flows into the ocean. They are found in areas where there is volcanic activity. The hot, acidic fluids may carry dissolved metals that can precipitate to form ore deposits. I must confess that along with my Mission from NOAA to perform the duties of a Teacher at Sea (TAS), I came aboard Rainier on a mission of my own. I came to see volcanoes, and even more specifically, I dreamed of discovering volcanic activity or active hydrothermal venting on the seafloor. For as long as I can remember I have been interested in ore deposits that form at vents. Before becoming a teacher, I mapped and studied ore deposits that formed millions of years ago. 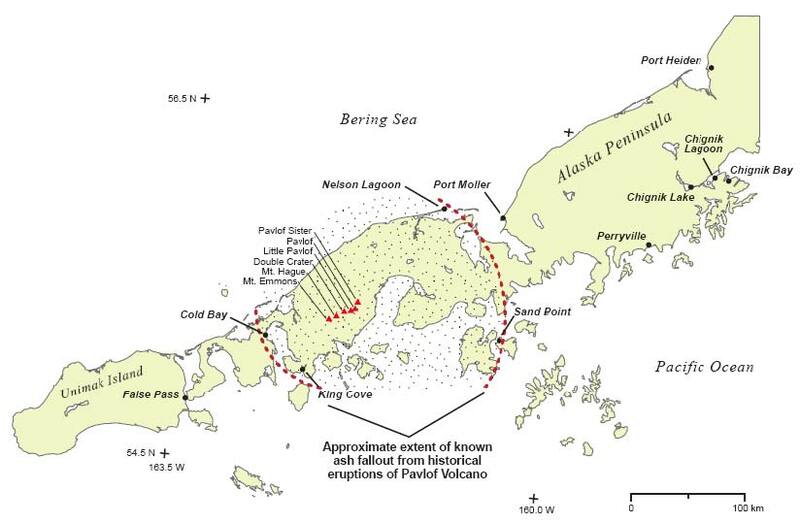 It would be very exciting to find evidence of an active vent here in Alaska. That evidence might be: cone shaped or cratered features on seafloor bathymetry maps; floating pumice; gas bubbling on the sea surface; local seawater color changes; and seismic activity (Carey and Sigurdsson, 2007). By searching the NOAA Vents website I was able to confirm that anomalous values detected by the CTD (Conductivity, Temperature, Depth sensor) instrument (described in log 2) can also be used to help locate hydrothermal vents. Prior to the cruise, I researched the geology of the area as best I could without knowing the exact location of our work area. When I arrived at Rainier, I knew there would be active volcanoes nearby, and I was ready to go. 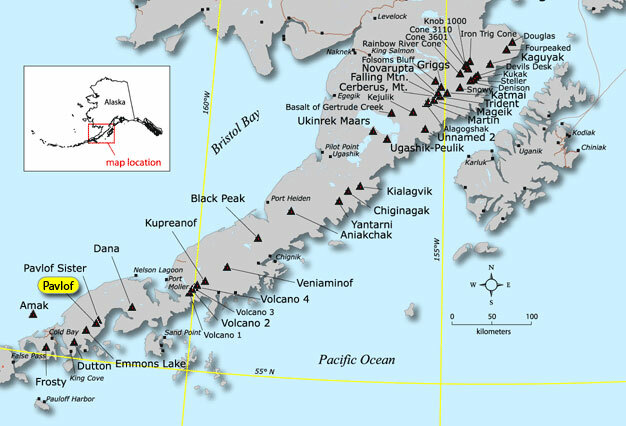 So far I haven’t seen evidence of hydrothermal venting, no floating pumice, discolored or bubbling water, and the Alaska Volcano Observatory, hasn’t reported seismic activity here within the last month. 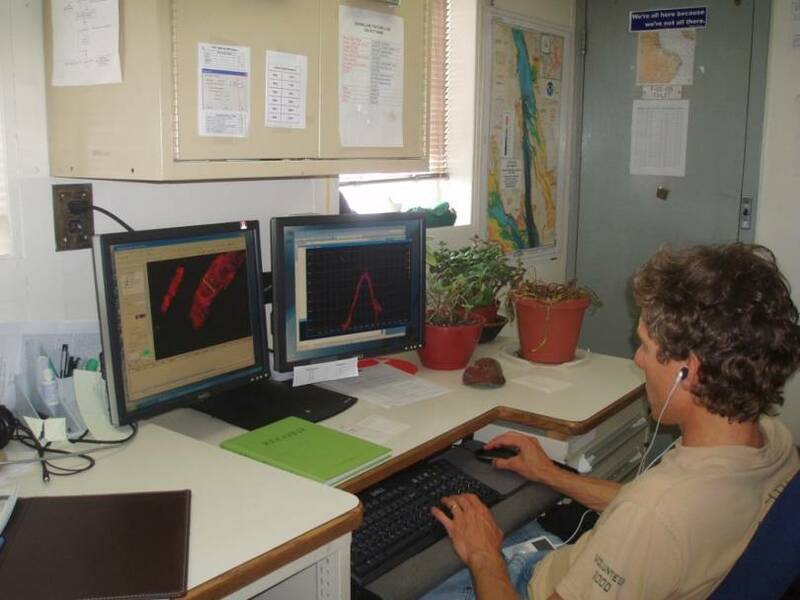 I have learned how to take a CTD cast, observed volcanic and glacial features in the local landscape, and studied the preliminary bathymetry posted on a chart in the Mess. I am not disheartened nor dissuaded from my quest. In fact, I am encouraged by news from the Office of Marine and Aviation Operations (OMAO) Newsletter for the weeks of July 21 through August 4, 2008 where I read the following report. Oscar Dyson and Fairweather: In late June, Oscar Dyson responded to a request from the Office of Coast Survey to investigate a reported area of discolored water outside Dutch Harbor. Dyson confirmed the discoloration during a transit and took a water sample that suggested a possible plankton bloom. OCS and OMAO then tasked Fairweather to investigate the anomaly during a scheduled transit. Fairweather personnel also confirmed the discolored water, and surveyed the area with the ship’s hull-mounted multi-beam echosounder systems. This revealed a group of small mounds rising a few meters off the seabed in about 100 meters of water directly below the area of discolored surface water. The sonar trace indicated that at least one of these features appeared to be actively emitting a plume of fluid or material. Based on a chartlett produced from the scan, OCS does not believe that these features pose any hazard to surface navigation. These results have been shared with the U.S. Coast Guard and the Alaska Volcano Observatory, as well as NOAA’s National Weather Service, Pacific Marine Environmental Laboratory, and Office of Ocean Exploration and Research. Rainier and I are only about 200 miles east of active hydrothermal vents. I have resisted the urge to shout, “Turn the ship around and head west!” After all, when compared to the vast territory that is Alaska, Dutch Harbor is right next door. References: Carey, Steven, and Sigurdsson, Haraldur. 2007. Exploring submarine arc volcanoes. Oceanography, 20, 4: 80-89. To learn more about discovering hydrothermal vents and to watch a submarine volcanic eruption, check out the websites below. This entry was posted in 2008, Lisa Hjelm, NOAA Ocean Service, NOAA Teacher at Sea and tagged Alaska, bathymetry chart, CTD, Hydrographic survey, launch, multibeam sonar, noaa ship rainier, pavlov islands, thermal vent, volcano. Bookmark the permalink.